Dr. Julianne Preston received her DVM from Michigan State University. While she grew up primarily in Michigan, Dr. Preston is new to Ann Arbor . She is becoming acclimated not only to all the maize and blue, but also to all of the opportunities the city has to offer. Most importantly, Dr. Preston is very excited to be a part of the team at the humane society. 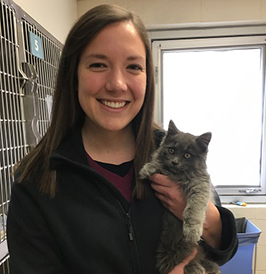 The strength of the human/animal bond drove her to pursue a veterinary career, and working at HSHV allows her to celebrate this daily by watching new adoptions grow to a lifelong connection. Dr. Preston feels fortunate to have assisted with veterinary work in other countries like bat rehabilitation in Australia and promoting population and disease control with street dogs in Nepal. Outside the clinic, you may find Dr. Preston running, biking, swimming, camping, hiking, traveling, spending time with family and friends, or lounging with her two rescue kitties, Pesto and Champ.